Yes, our Downy Library staff is still operating, and Claudia Daley, Literacy Specialist, and Ben Dickow, Director, stood in the lobby of the Rio Hondo Event Center to welcome each guest along with Fernanda Nunez, assistant from the City of Downey. The day was overcast, but volunteer Ethyl Kendrick brightened up the morning with a silver sequin head wrap to go with her black and white figured blouse. Head of Library Volunteers Virginia Yoshiyama, who wore fragrant white plumeria blossoms in her topknot, had the same idea. “I like to dress up the occasion,” Virginia said, and she did. The women and men in the room represented many hours of faithful service over many years, and they echoed Ethyl’s concern. Friend of the Downey Library (FODL) Mary Phelps sat near the string quartet as they played during brunch, which is appropriate because Mary is an industrious and long-time member of the Downey Symphonic Society Board. Friends of the Downey Library is the extremely active support group that raises money through events such as the Christmas bazaar and bake sale. FODL also underwrote the city’s appreciation brunch, so no tax dollars were used for this festive occasion. Guiding spirit for the luncheon Claudia Daley answered the burning question, what is happening after the city had to reject the bids for the new construction work? The Library Advjsory Board was thanked. It’s composed of one member from each city district: Betty Monroy, Kimberly Hayes, Marie Yusem, Karol Morrison and Beverly Mathis. A bright pastel arrangement of spring flowers, pink and lavender and white, centered each of the seven tables, and men represented about 20% of the attendees. More volunteers are always invited. Councilman Sean Ashton, in his red City of Downey polo shirt, led the Flag Salute and gave the invocation. Sean said that the color was a personal choice, as evinced by Alex Saab in black. “There are maroon ones too,” said Sean, who volunteers for eco projects like Keep Downey Beautiful. and at the PTA at the school where he teaches. Friends Bookstore Volunteers Colette Stallcup and Elsa Frazier. Claudia, spring-like in her daffodil yellow jacket over a white dress covered with a floral display, then gave the keynote address. She began with the generosity of the Downey Women’s Club 60 years ago, when they gave their collection of books to the City to start its own Library. Now that the library is to be closed for 18 months, the Los Angeles County and local libraries like Santa Fe Springs, City of Commerce and Norwalk have stepped up to open their shelves to Downeyites. The book-orphans of Downey thank them. Claudia’s fascinating history singled out special people like Councilwoman Joyce Lawrence, Cleo Latimer and Louise Cormack who made an extra effort to get the library going during the early years. The library partnered with the Assistance League of Downey to set up Books on Wheels, bringing books to homebound patrons, adults who can no longer go out into the world. In the 80’s, Soroptimist Club members provided Downey children a Great Books Club in a local park. Jean Brazelton used her expertise as a teacher and a writer to teach high school students how to write their college entrance exams. Now there is a program to package books to send to soldiers. After a generous buffet of scrambled eggs and hash browns, fruit and mini muffins, and sausages and bacon, Claudia opened the awards part of the morning. Each volunteer was recognized by name and a short phrase describing their contribution was read as they came forward. All five City Council members shook hands with the volunteers, and presented a handsome Certificate of Appreciation in a black and silver folder. The little gift bag contained a silver case for business cards, which even retired persons now find helpful in this day when everyone exchanges email addresses. A special shout-out to Major Donors came in the form of a handsomely illuminated scroll in an ebony frame. Receiving the award were Friends of the Downey City Library; Theresa and Michael Gallagher; Peter and Patricia Meursinge; and the Rotary Club of Downey. The latter has a long-running program where each week the library sends them a new book purchased with funds that Rotary donates. The club then asks the week’s program speaker to honor them by signing the book, as a memento of their appearance. SEEN IN CONVERSATION: Volunteers Jackie Odell and Sandra Albornoz stopped by to talk about the stories in the Patriot about the two homeless women at the Downey Post Office. Note well: The library may be closed, but the volunteers and friends plan to continue to meet. A picnic supper in Furman Park on Wednesday, July 17, will be the first reunion, to hear the Department of Parks and Recreations’ Summer Concert Series, The Wiseguys, who play big band music. Come at 5:30, because the Board of the Friends of the Library will bring salads to share, and there will be food for sale by the Downey Rose Float Association. Everyone works together. Other get-togethers are planned for November and each three months till the library opens. Meanwhile, are the staff at the Library keeping busy? John Vincent at Downey’s 2013 Veterans Day ceremony. 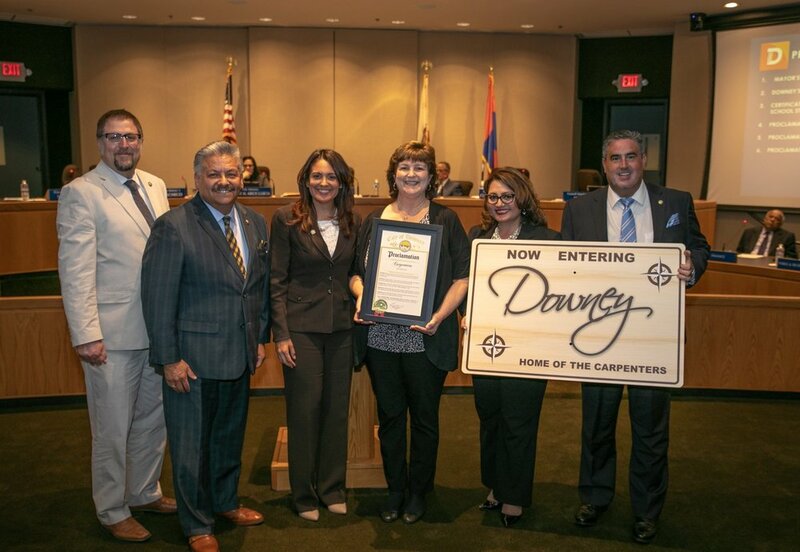 The town of Downey has approximately 110,000 residents and each one has a story. This week I want to honor one of them: John G. Vincent. John is 97 years old and past president of the Downey Historical Society. He held this position for over 25 years and was instrumental in writing, collecting and keeping historic artifacts for this city. John is a quiet man who when asked about his military service did not go into much detail in tellis his story but being a writer and poet captured his story on the written page. John was a teacher of science classes in Santa Fe Springs, a member of the Delvers -- gem and rock collectors -- and a proud American. Memorial Day is coming in May and this celebration is always important to him as he served in the U.S. Army for almost five years during World War II. His service during the war and seeing the sacrifices that he and other soldiers gave made him know that the freedom we have did not come easy. Being away from home for many years made him appreciate his family and home. John’s travels while in service took him hopping from island to island across the vast Pacific and eventually took him to Yokohama, Japan during the U.S. occupation. He got to encounter Gen. Douglas MacArthur while sitting aboard a troop ship in Tokyo Bay and watching the Japanese board the USS Missouri to sign the surrender. John served as a bugler during his basic training at Fr. Leonard Wood, Mo. John admits he did have a time when he sweated while being on a troop ship when it was attacked by Japanese torpedo planes during the Battle of Leyte Gulf. John was a member of the VFW Barracks of Downey Post 2325 for many years. His respect for our country and flag makes him a role model for the way I want to live my life. Thank God for men like John who contribute so much to our community. I salute you, Corporal John Vincent, Second Army Eleventh Corp, Two Eleventh MP Company in World War II. After returning from Armenia in 1997, I obtained a position as the accounting manager at a construction company. It was a good job but not very interesting. I thought my volunteer experience in Armenia, combined with a regular job, would be good -- so I applied for a staff position with Peace Corps. They offered me the position of Associate Director in Ulaanbaatar, Mongolia. I declined. They then offered me the same position in Kazakhstan and I accepted. When I arrived, a driver met me and drove me to a temporary residence. He picked me up the next morning and took me to the office to meet the country director and my staff. I needed a place to live so I assigned that job to Yerkin, my general services officer. He showed me three places and I selected one that was half a block from the office with electricity and running water 24 hours a day -- and a piano. My duties included all administrative duties supporting 200–300 volunteers. Because the cashier reported to me, I had to become a State Department cashier. I set up an intern program for college students. My first hire was my landlord’s daughter, Assel. When she got married, I was the guest of honor at the wedding. Being the guest of honor, I was presented with the eye of a sheep. Discretely I slid it to Yerkin. One day I compared the clock at the railroad station to my watch. They did not agree. I asked why the difference and was told that in the former Soviet Union, all trains ran on Moscow time. And they still do. I had to attend a conference in Ashgabat, Turkmenistan. I selected Misha as my driver and took three of my staff with me. We drove thru Kyrgyzstan and Uzbekistan. When we were close to Ashgabat, my gout flared up. Misha called ahead and told them I was in pain. When we got to the office, two medical personnel were waiting for us. A party had been scheduled for the evening but the doctor said no party for me. I had to stay in my room, drink lots of water and take medication. Later, there was a knock on my room. I hobbled over and there stood Misha. He came back because it was not fair that I had to be alone when everybody else was enjoying the party. The next day I felt a little better so Misha and I went sightseeing. In the main square of Ashgabat was a gold-plated statute of the president of Turkmenistan that rotated so that the sun always shone on his face. Then it was back to Almaty. A short time later, I said goodbye to Kazakhstan and returned home. And what happened after that is the subject of a separate story that led to many more adventures. A Downey native and 2007 Downey High School graduate is serving in the U.S. Navy aboard USS Portland, one of the Navy’s newest and most advanced amphibious ships. A near sold out Downey Theatre takes in a night of Gershwin. Homeless residents take turns panhandling outside Downey’s main post office. The generosity of strangers determines if they go hungry. Downey’s civic leaders turn out in support of the Rancho Los Amigos Foundation. Dani Moreno has found success as a professional trail runner. Courtesy photo. Dani Moreno, a 2010 Warren High graduate, has found success as a professional trail runner.